Provo • The street south of the burned out Provo Tabernacle is no longer a public street. The Municipal Council on Tuesday unanimously voted to vacate a one-block stretch of 100 South between University Avenue and 100 West. The vacation is the first step toward selling the street to The Church of Jesus Christ of Latter-day Saints. The church has asked to buy the block as part of its plans to convert the tabernacle's ruins into the Provo City Center Temple. The church has already purchased the Travelodge Motel and Los 3 Amigos restaurant to the south of the tabernacle, along with the site of the former Hotel Roberts. But there was no indication as to whether the church will buy the Howard C. Nielsen post office, the remaining building on the block south of the tabernacle. "There may be a sale, but we do not know," Council Chairwoman Laura Cabanilla said. "And if there is a sale, we don't know what the [church's] timeline [would be]," added Brent Wilde, the city's assistant community development director. The church said it wanted to purchase the 100 South block as part of its plans to develop the temple site. The Planning Commission recommended approving the vacation of the stretch of street in March. At that meeting, the only serious objection came from Ted Schofield, owner of Heindselman's Inc., a sewing supply store. In a letter to the city, Schofield said the move would force traffic onto Center Street and make it harder for police and fire crews to respond to emergencies. He also warned that the city would be opening itself to lawsuits, such as those filed when Salt Lake City sold a block of Main Street Plaza to the Mormon Church. A city traffic study found that closing the street would not adversely affect downtown traffic. The closest thing to an objection came from Councilman Sterling Beck, who wanted to make sure the public would still be able to traverse the area where the road was. Beck said he bikes on 100 South, and knows that other people use it to get around the city. The next step is for the city to declare the road surplus property and have it appraised to determine its market value. When the city vacated 100 West between Center Street and 100 South for Nu Skin Enterprises' headquarters expansion, the city's Redevelopment Agency paid $1.025 million for the street. The RDA gave the property to Nu Skin, and the city will recoup the money through property taxes, city spokeswoman Helen Anderson said. The church has also offered to buy Nu Skin's parking terrace to the immediate west of the tabernacle. Nu Skin representatives have confirmed the church's offer, and said the company plans to build another one nearby. The 129-year-old tabernacle was gutted in a fire Dec. 17, 2010. In October 2011, LDS Church President Thomas S. Monson announced the plan to restore the building and convert it into the faith's second temple in Provo. The church will break ground for the new temple on May 12. Temple construction typically takes two to three years. 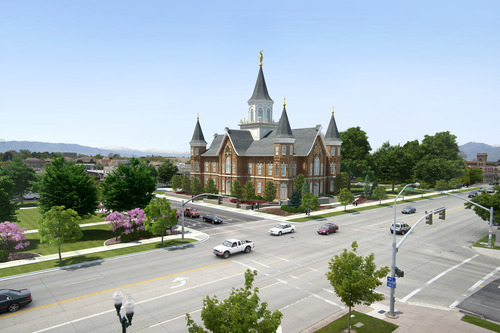 P The Church of Jesus Christ of Latter-day Saints will break ground for the Provo City Center Temple on May 12.